Cafe Rio Black Beans | The Best Black Beans Recipe! This Cafe Rio Black Beans recipe is a perfect side for taco night! Flavorful, salty, and slightly acidic, they fill out any meal and are the easiest to make! Have I ever told you about my love of black beans? Seriously. They go well with practically everything! This Cafe Rio hack might tempt you to make a double batch because it has all of the elements you could ever want: it’s easy to make, easy to clean up, and tastes incredible by itself, in a burrito or taco, or tossed on top of a salad! Versatility is a must in my kitchen, and these black beans deliver. They’re delicious the first time around, and almost get even better as leftovers, after the flavors have really blended over a day or two’s time! The cumin adds a bit of earthy spice, while tomato juice and cilantro balance it out with a bite of tangy freshness. Yes! Beans and legumes are underestimated superfoods. Packed with protein, fiber, and vitamins, they round out meals and leave you full and satisfied for a long time! Can you use a different type of bean? 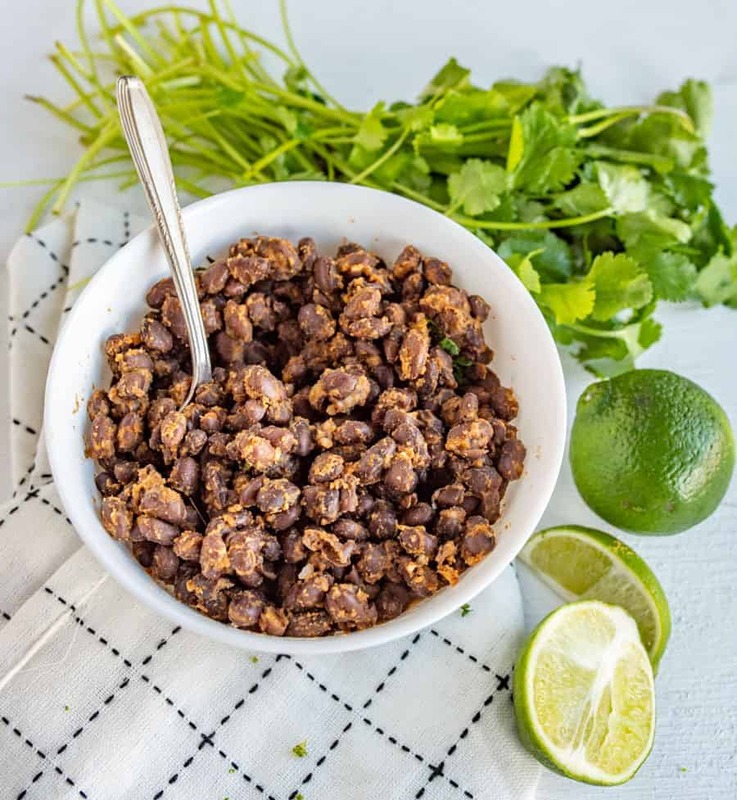 If you or a family member isn’t a huge fan of black beans, pinto beans would be an awesome substitute for this recipe! They’re similar in taste and texture, but really, this is such a simple and fresh recipe that you could use your bean of choice and it would turn out great. Do black beans have to be soaked before cooking? Some people prefer to cook using dry beans that need soaking before cooking, and it’s totally up to you if that’s what you like! But if you’re short on time and want a quick and easy black bean dish, I’d go with canned beans. It drastically cuts down your prep and cook time, and tastes just as good! What do you eat black beans with? What DON’T you eat black beans with? These are tasty in so many dishes that it’s hard to choose just one… Try them in burrito bowls, salads, tacos, enchiladas, quesadillas, Buddha bowls, breakfast burritos, or just plain ‘ol by themselves! In a medium skillet, heat the garlic and cumin in the olive oil over medium heat until fragrant, about 2 minutes. Add beans, tomato juice, and salt. Continually stir until heated through. Just before serving, stir in the cilantro. I often use cooked dried beans instead of store-bought. If you do this, too, plan on more salt because they’ll need it. For the tomato juice, I make this salsa before I prepare the beans, and when I am ready for the tomato juice I just pour in the same amount of salsa juice that has collected in the bottom of the bowl. Delish! This is one of those quick side you are going to make again and again until you have the recipe memorized. ENJOY! That looks yummy! 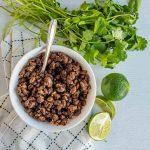 I love black beans, but the hubby doesn’t – maybe I can get him to like them with this recipe?? That would make my day! My husband doesn’t *do* beans either, but he likes these. Once you load them up in the burrito with all the other Cafe Rio recipes you can’t really even tell they are there! They just add to the deliciousness that is the burrito.